June 1940 and whilst Britain licks its wounds after the debacle leading to Dunkirk and France teeters on the edge of defeat, Paul Duggan has been transferred to G2, the Irish military intelligence division, given his knowledge of the German language and the string pulling of his uncle, a politician. Ireland is pursuing a policy of neutrality, though some favour siding with the Allies and others with the Germans in the hope of gaining a united Ireland. Duggan has been assigned the task of monitoring a German national who is sending cryptic and receiving saucy letters to the continent but otherwise seems inactive. He’s also been asked by his uncle to find his cousin who has gone missing and has possibly been kidnapped. Duggan slowly makes progress on both cases, aided by Special Branch detective, Peter Gifford, whilst trying to keep the hunt for his cousin a secret from his bosses. Nothing, however, is quite what it seems in the murky world of spies and politics. 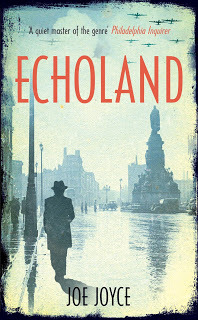 Set in 1940, Echoland is set during a fascinating period of contemporary Irish history as it the country tries to negotiate its neutral role and its relationship to Britain and Germany. Joyce weaves an interesting plot involving G2 (military intelligence) and Special Branch as they keep tabs on the German legation, suspected German spies, and the IRA, who view the war as an opportunity to leverage a united Ireland. The plot is the strength of the novel, nicely intersecting two storylines – the hunt for a German spy and trying to trace the whereabouts of a politician’s missing daughter. Joyce’s storytelling is all tell and no show, detailing the action and dialogue of the main characters. Whilst this worked to a degree, the lack of reflection and historicisation rendered some of the story flat and lacking in atmosphere and tension and the characters one dimensional. For example, the reader is presented with lists of streets that the characters traverse, but very little description of them or the activities taking place, or the general mood of the populace or how the war was affecting them. Nor is there a wider sense of the lead up to Ireland’s political position at the time. There is practically no back story with respect to any character, with the lead character being curiously asexual, apolitical and naive, and at the end of the book I felt I knew as much about him as I did at the start. The result was a book carried by its plot, but one that lacked the atmosphere, depth and subtle tension evident in similar kinds of Second World War espionage tales such as those by Alan Furst, David Downing, Aly Monroe or Joseph Kanon (a selection here). Nevertheless, an enjoyable and interesting tale and I'd read the next instalment if it Echoland is the first in a series. Rob, I went to your list of historical crime fiction set in the 1930-1950s. It is a great list. I sent the link to my husband. I have read a lot of them, but there are still some I can look for. Thanks. Thanks. I need to update it as it's been a while since I did the post. 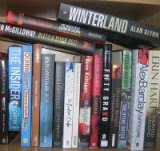 I might also put in multiples by different authors. If you've got any recommendations that aren't on the list I'd love to hear about them.